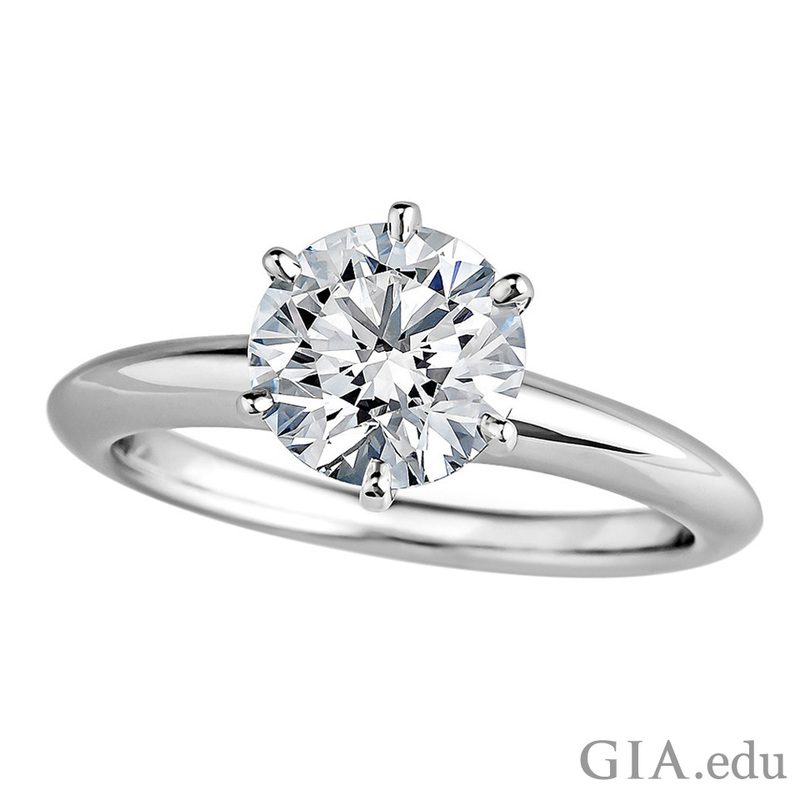 If you’re looking for a round diamond, the round brilliant cut is one of the most popular styles for engagement rings. It’s flattering on the finger, it captivates with its sparkle, and it’s a contemporary classic. Learn how to pick one. 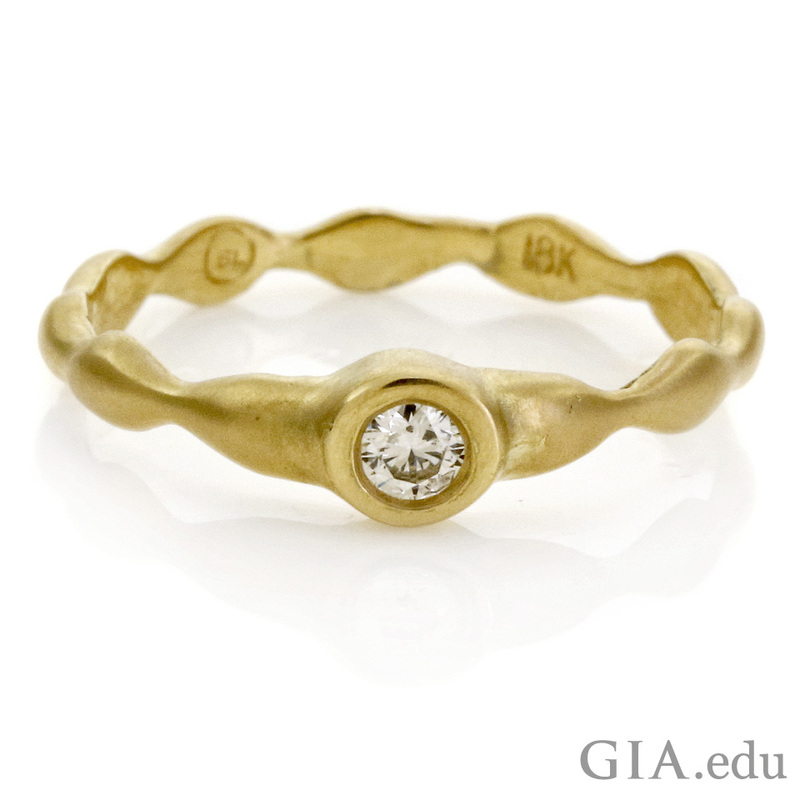 Although round diamonds date to before 1750, it was the invention of the bruting machine in 1873 by Boston diamond cutter Henry Morse that made it easier to produce them with a pleasing, symmetrical outline. This mechanical marvel let diamond cutters produce very round diamonds instead of following the shape of the original crystal, which most commonly yielded a square or rectangular cushion-shaped diamond. 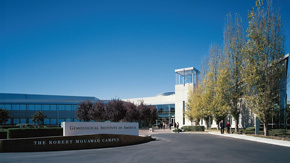 Morse also invented the first gauge to measure the angles of diamonds. 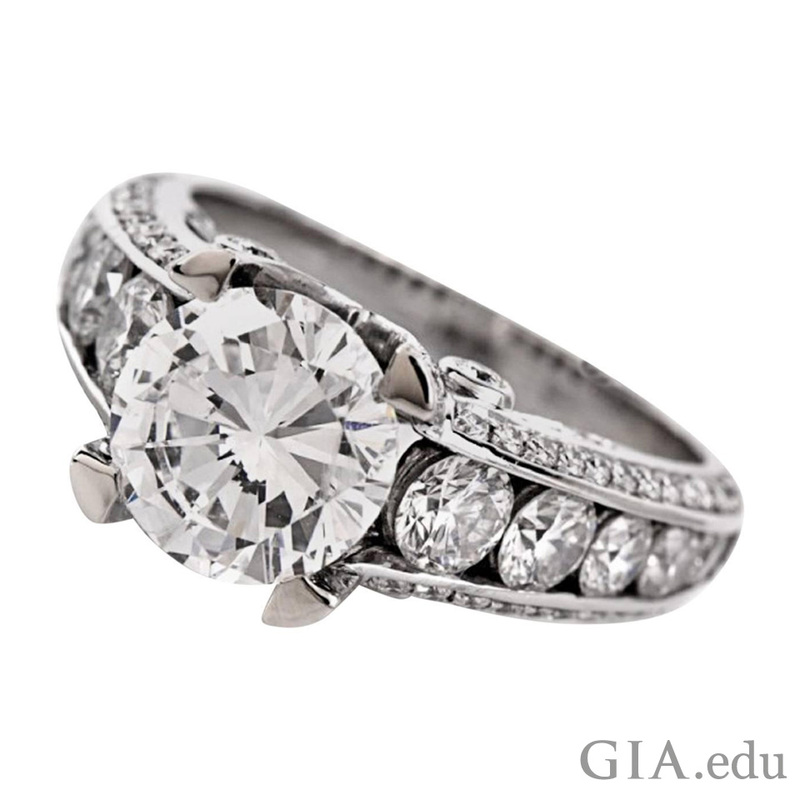 He experimented with facet angles and proportions of the round diamond, developing a cutting style known as the American cut, the forerunner of the modern round brilliant cutting style. Today, round brilliant cut diamonds are fashioned using high-tech automatic-cutting equipment to exacting standards using time-tested diamond proportions. This type round diamond is the most popular and accounts for about half of all diamonds sold for engagement rings, according to a 2015 survey by The Knot. Popular for engagement rings, a round diamond – when brilliant cut – is sometimes referred to by its acronym, RBC (Round Brilliant Cut). Round brilliant cut diamonds have a round girdle outline, symmetrically placed triangular and kite-shaped facets and a table. This cut can have 57 or 58 facets depending on whether the diamond has a culet facet. The number, size, and placement of the facets deliver the incredible sparkle and the flashes of color associated with a brilliant cut diamond. 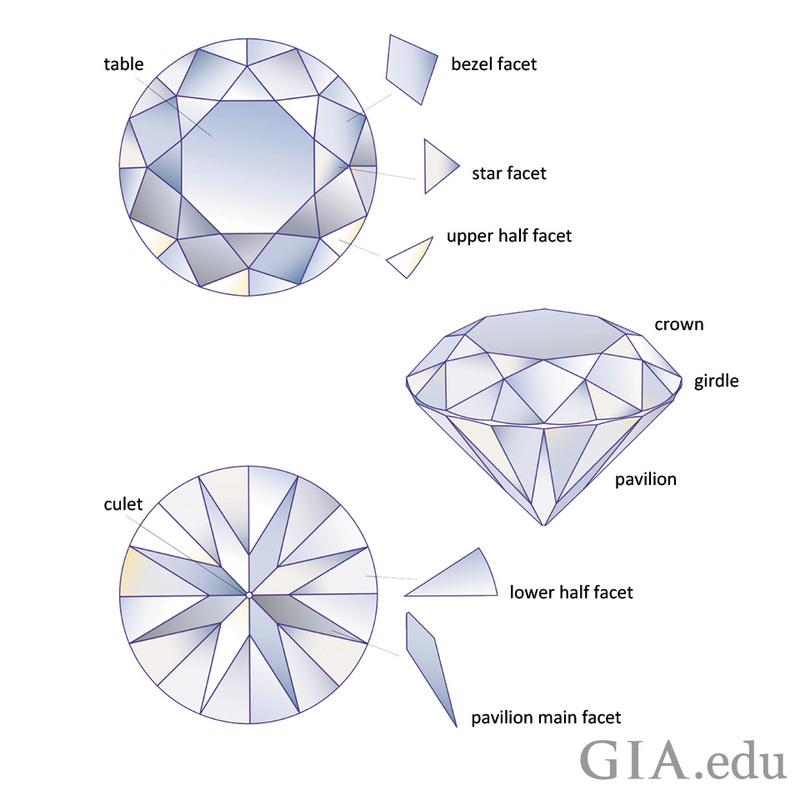 This illustration shows the parts of a round brilliant cut diamond (RBC). The crown has a table facet, bezel facets, star facets, and upper half facets. Below the girdle, the pavilion has lower half facets, pavilion main facets and a culet. Illustration: Peter Johnston/GIA. A diamond’s facet arrangement is key to understanding how it interacts with light: think of the facets on a brilliant cut round diamond as a complex series of mirrors reflecting light and the environment around it. As you shop for your diamond, be aware of the lighting under which you view it, as light has considerable effect on a diamond’s appearance. Look for brightness (often called brilliance) – the effect of all the diamond’s internal and external reflections of white light. This is best observed under diffused lighting. 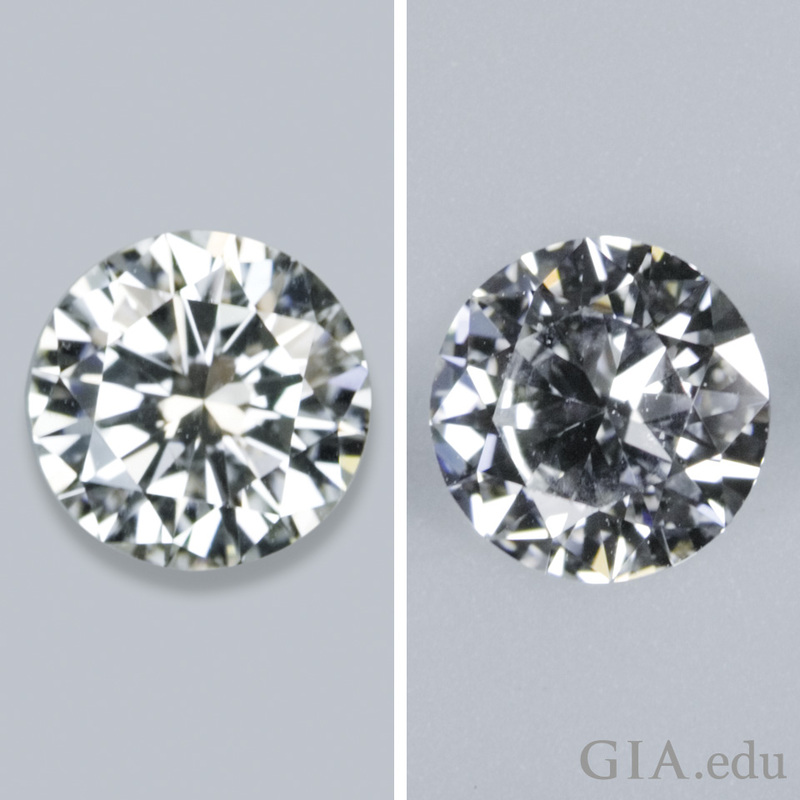 Well-cut diamonds are brighter than poorly fashioned ones, even if they’re of equivalent size, color and clarity. Poor polish and symmetry causes brightness and fire to diminish. The diamond on the left is extremely bright. The diamond on the right is not very bright. Photos: Eric Welch/GIA. Look for red, blue, yellow or orange flashes as you rock and tilt it under store spotlights. This is called fire. It’s caused when white light traveling through the diamond is dispersed into its rainbow of spectral colors. Look for sparkle – the spots of light that flash when the diamond, you or the light source moves. Look at the patterns of bright and dark areas that result from a diamond’s internal and external reflections. You should see enough contrast between the bright and dark areas to give the pattern a crisp, sharp look, but no larger distracting dark areas. Look for scintillation – a combination of sparkle and pattern. 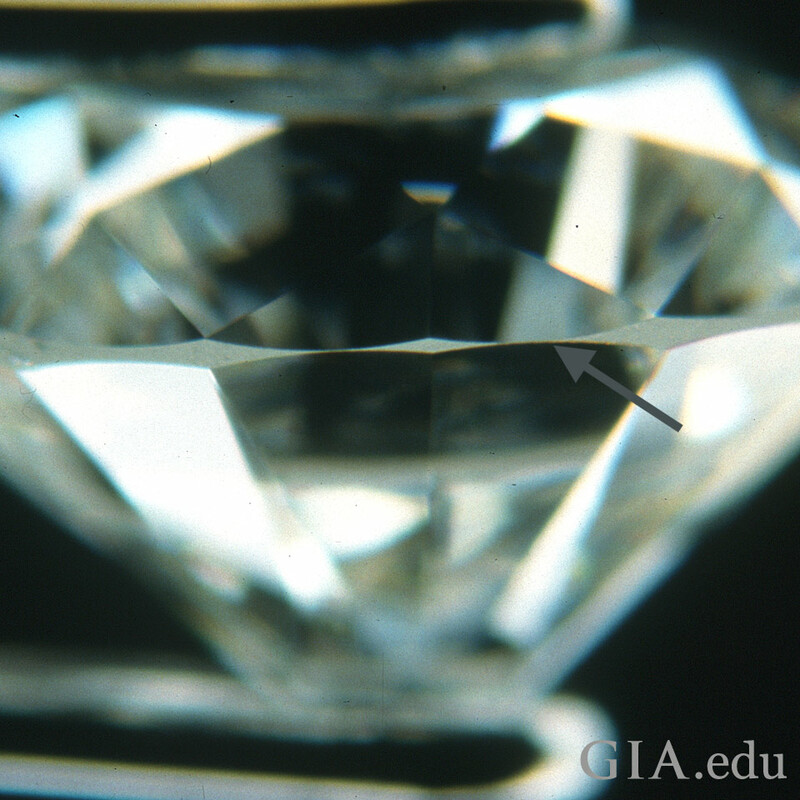 In an attractive diamond, the reflections should appear fairly even and balanced in size. 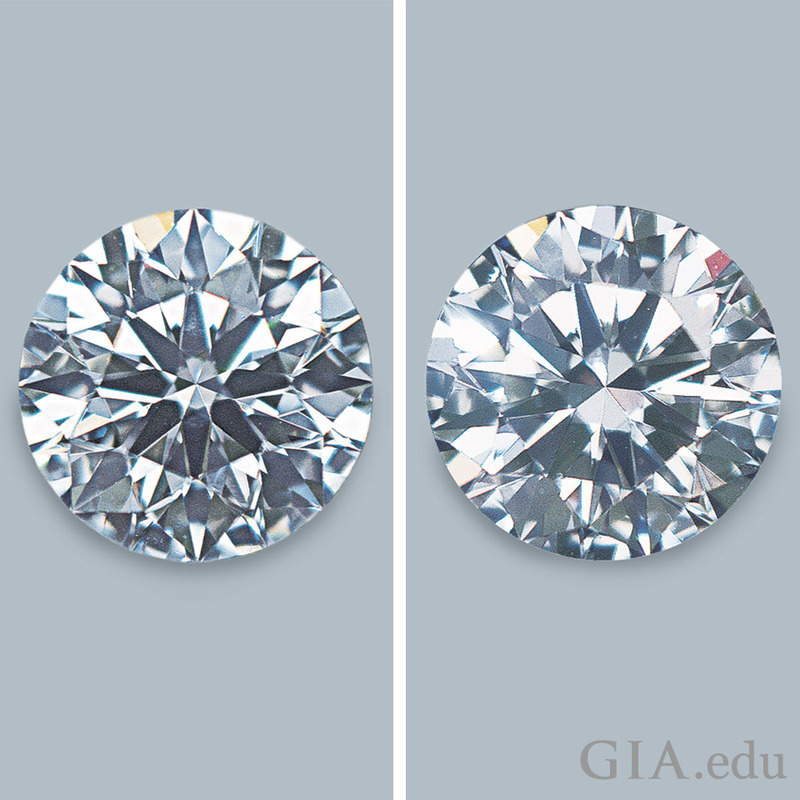 The diamond on the left displays more attractive sparkle and scintillation than the one on the right. Photo: (Left) Al Gilbertson & Barak Green/GIA. Photo: (Right) Al Gilbertson & Maha Tannous/GIA. Consider the diamond’s durability: even though it ranks 10 on the Mohs hardness scale, a diamond can still chip and break. Avoid diamonds with extremely thin or “knife-edge” girdles, which make them more vulnerable to damage. Consider the number, type, and placement of diamond inclusions near the girdle, as they may make the diamond more prone to chipping or breaking. This diamond has an extremely thin girdle, the middle portion of the diamond, or the narrow section separating the crown (top) from the pavilion (bottom). making it more vulnerable to being damaged. Courtesy: Gary Roskin, G.G., F.G.A. 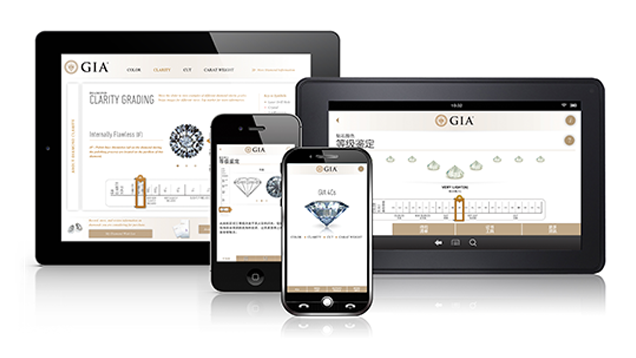 A GIA Diamond Grading Report or Diamond Dossier® is invaluable in helping you select your perfect round brilliant cut diamond. In addition to an objective assessment of the diamond’s cut quality, the reports also evaluate the diamond’s carat weight, color and clarity – additional quality factors you need to consider in selecting your diamond. There are many different ring styles that complement round diamonds engagement rings. Solitaire settings, with a single stone as the focal point of the ring, are always popular. 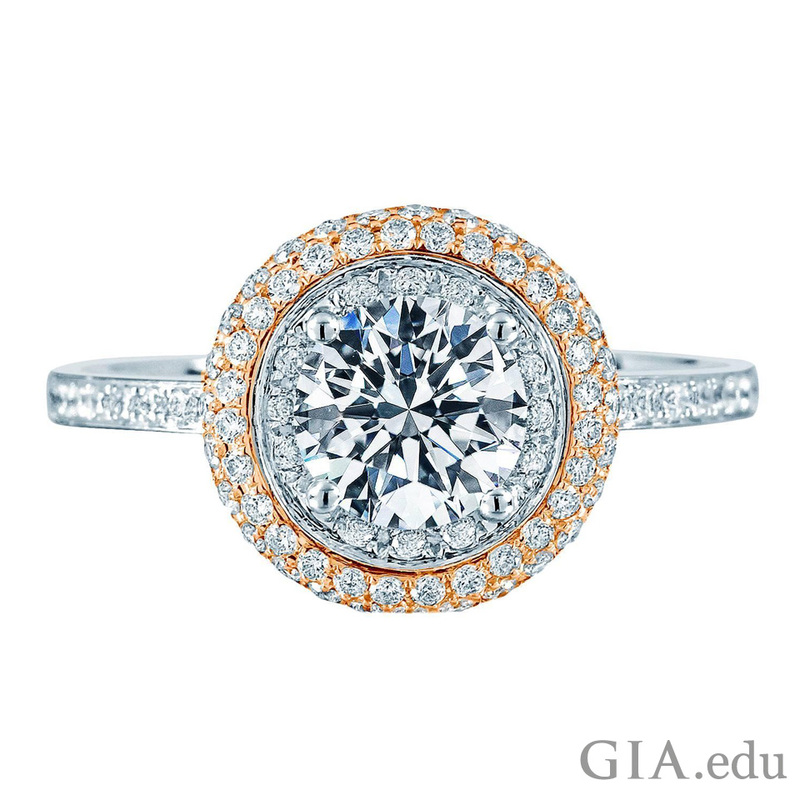 Round diamonds are often set with side stones or surrounded by a halo to accentuate the center stone. Prong settings: This setting holds the girdle of the stone from beneath. 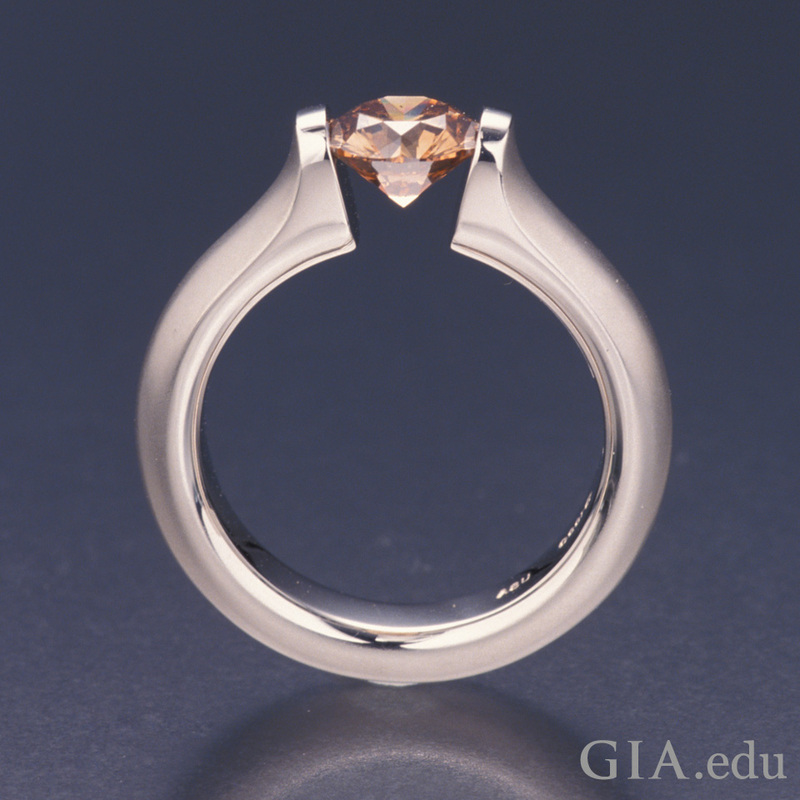 Prongs hold the stone over the band to show off the size of the diamond while maximizing sparkle. The six-prong setting, introduced over 125 years ago by Tiffany & Co., remains a favorite choice for engagement rings. A four-prong setting is also a good option, and if you’re trying to decide between the two, you might want to learn the pros and cons of each prong setting style. Cathedral Setting: This setting gets its name because it resembles the support arches found in places of worship. 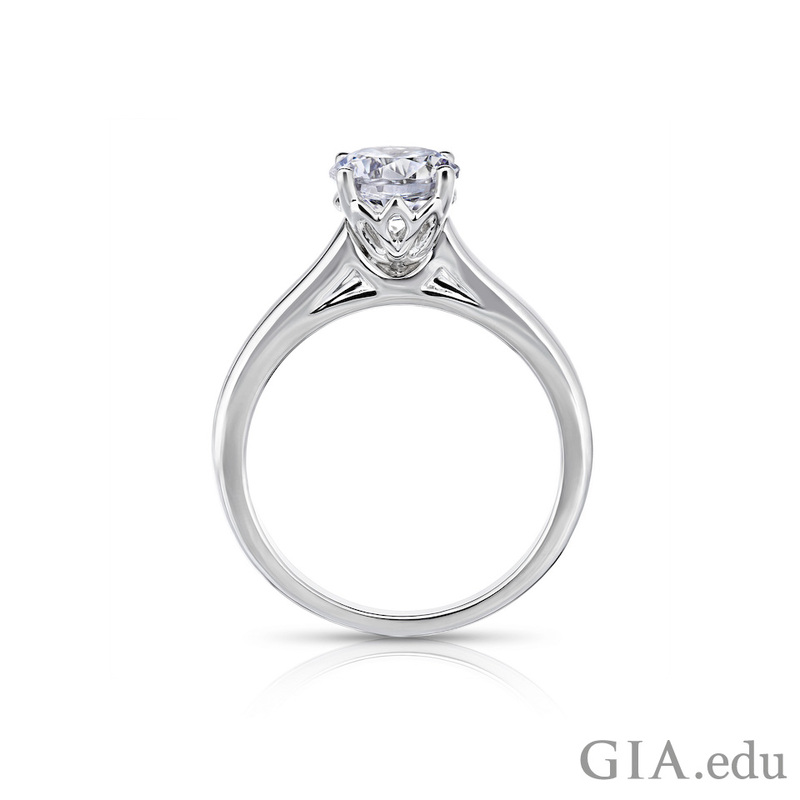 It is a prong setting with slopes on either side of the diamond that allow it to be visible. Bezel Setting: Sleek and modern, metal completely surrounds the diamond giving the diamond’s girdle maximum protection – a great choice if your intended has an active lifestyle. Tension setting: The diamond is held in place by pressure from two opposing pieces of platinum or karat gold which creates the illusion that the stone is floating. This setting allows the diamond to be cleaned easily because there is no metal below it, but the diamond is partially exposed, making it more vulnerable to accidental damage. This setting isn’t the best choice for active people. This tension set round diamond engagement ring, designed by Steven Kretchmer, makes a dramatic statement. Photo: Robert Weldon/GIA. Gift of Steven Kretchmer and Eightstar Diamond Company. Adding side stones to your round diamond engagement ring lets you add more sparkle and customize the ring to reflect your intended’s personality. Pavé setting: Many small gems are set close together, sometimes in a honeycomb pattern, creating the appearance that the ring has been “paved” with diamonds. A pavé setting can encircle the round diamond center stone like a halo (also known as a halo setting); extend along the band, or both. Either way, it’s an elegant look! Channel setting: A grooved channel holds side stones that are set edge-to-edge in a row. If you’re leaning toward an engagement ring with a round center stone and baguette side stones, a channel setting is a popular option for setting the side stones. Round diamonds and princess cut diamonds can also be channel set. The gemstones are well protected, making this type of setting style a great choice for daily wear. Whether you want the sleek, minimal elegance of a single round diamond in a classic solitaire prong setting, or up your game with accent stones and a different setting style, a round diamond is a timeless choice for an engagement ring and can be the perfect expression of your love. Ready to do some shopping? Why not brush up on these common engagement ring terms to help you communicate your desires to your jeweler?